Well, as it turns out, I’m going to be spending Thanksgiving alone. It’s OK, I don’t mind–I do so at Christmas, since I have no family. (Around or available–this is a good thing.) I’ll watch some good old-fashioned British comedy on DVD and catch up on some sewing. I was already going to do that, as well as make this dish from whatever remained from the turkey. Very low turnout for our potluck, so it was decided that we would *not* cook a turkey. Since the hostess is veeegan and likely the other *two* are too (or some other ridiculously weird diet only they know about), one is not of the friendly sort (like me, these days), I backed out. Not going to be very enjoyable–especially when I can use a rolling pin to help someone get over their stupidity. I can, you know. That’s why I’m staying AWAY from everyone much as I can. I can’t afford an attorney. 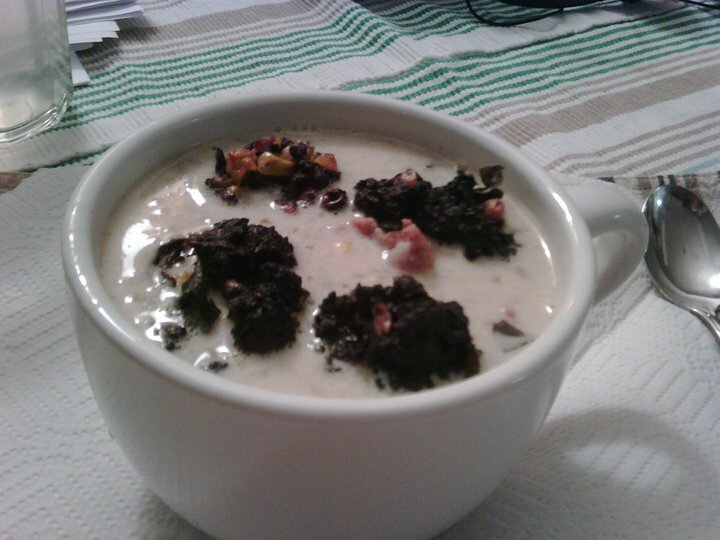 One thing I have made every year since 2006 is make this incredible soup. I found it in the November 2006 Everyday Food magazine, but it’s not an EDF recipe. Glad added it in as a pullout card with an advert for their plastic food containers, as they did for quite a few years. It looked pretty good, so I made some to use up the turkey and dressing and stuff. It is the most delicious thing ever. Make it exactly as is. You eat this soup, you become ENLIGHTENED. It’s that good. After the first time, I wanted more for Christmas. I went to get turkey PARTS at the grocery, but. . .all I could get was a 12-pound turkey. So I roasted me a big turkey and made this soup. Repeatedly. It was literally what I ate for the entire holiday break, about ten days. I just kept making more soup, and dressing as I needed more. I LOVED it. I’m going to HAVE this soup, of course, but I’m skipping the “dinner” part and going directly to the soup part. I’m roasting two turkey thighs, and making some Tarragon Turkey stuffing/dressing from an old Suzanne Somers cookbook (for the dumplings), and have at it tomorrow. Doesn’t take long, either if all the parts are completed. Take your spoon and cut a piece of a hot, crispy dumpling while scooping up some soup in it. Become enlightened. Repeat as needed. You have just become enlightened. Don’t say I didn’t warn you. If you’ve got Thanksgiving leftovers, first, consider yourself lucky. Some folks don’t. Say a prayer of thanks. Me, I’m happy to be able to get me some turkey thighs and make this for myself. Although I only make this once or twice a year, you can make it pretty much anytime you want. Turkey parts are available all year long, and you can use pretty much any kind of stuffing you want. The first year I made this after Thanksgiving, I brought it for lunch for a week. Two people at work asked me for the recipe, so I gave it to them. (Many were following me around asking, “what’s THAT? ?”) One of the Engineering guys told me his wife made it, and they used. . .Stove Top Stuffing. UGH!! But they loved it, even with Stove Top. So it is worth the little extra work to make it whenever you want it, using your favorite stuffing/dressing. I’m going to be busy this weekend, sewing, among other things, but I may not get back to post here at HeatCageKitchen for a few days, so be patient. I have to have some new adventures, and I don’t anticipate that just yet. I mean, who gets excited about a breakfast sandwich or a panini from Starbucks? Have a great Thanksgiving, whatever it means to you. And if you’re alone, enjoy the time alone and have yourself some of this delicious Leftover Turkey Chowder (for more than one day, too.) What you have for dessert is up to you, but there’s lots of easy desserts you can make online. Make something with cranberries while they’re available fresh. Or chocolate–how can that be bad? Better yet–chocolate AND cranberries. And let me know what you made with them, because I’ve never put them together. Yet. Make it a point, as I have, to never miss another holiday meal again, even if you have to be by yourself. Enjoy it, and you won’t worry about being alone for a holiday anymore.